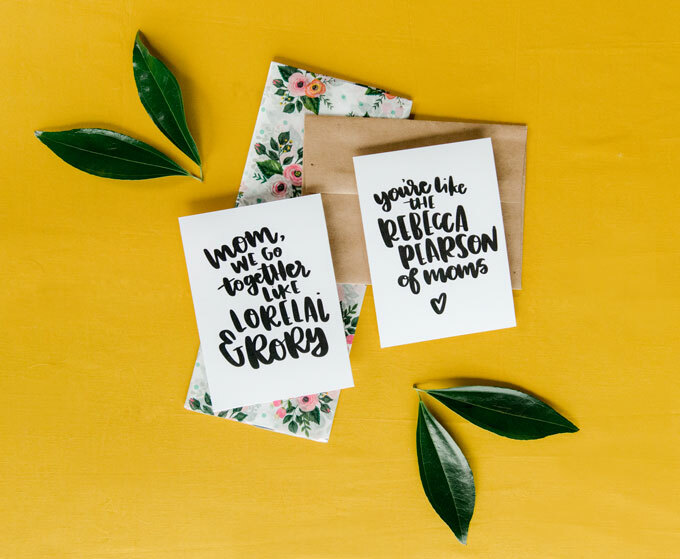 This Is Us + Gilmore Girls Inspired Mother’s day Card Printables! Let’s just agree on one thing……both This Is Us and Gilmore Girls have been two of the best shows on television in a LOOOOOOONG time! 🙂 The drama, the characters, and the love of This Is Us ANDDDDD the relationships, the banter and the quirks of Gilmore Girls. I mean, YUP! Both make me laugh and cry and just fall in love with the Pearsons and Stars Hollow! 🙂 AMIRIGHT?!!! BUUUUUUT you can just cut the “outside” portion to make a “postcard” style card if you’d like too!